We have covered a lot of cooking assistance solutions here. From cookbooks that are searchable recipe lists to very detailed cooking instruction manuals made by some seriously big names (If you have an iPad, Gordon Ramsay is in your kitchen , Culinary Institute of America on the iPad with a new way of buying what you need to name a few). But, here we are, a day before the US Holiday to cook a very large Turkey and you have yet to step up to any big recipe solutions. Safeway hears your pain and is providing a simple free app to make you the winning chef at the family lunch this year. The Safeway Chef Assistant lays out what you need to buy (we are assuming they would prefer you buy those items from one of their stores), prepping the turkey and even a timer for how long to have it in the oven. 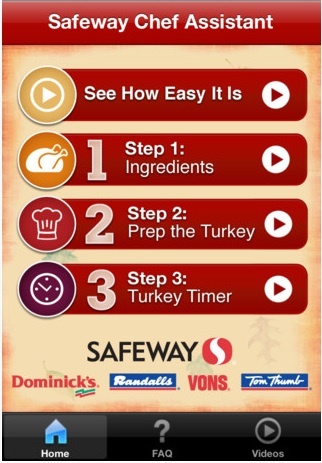 The Safeway app is all about their Exclusive 2-Hour Turkey Recipe so this can be an app you can install even after you wake up thursday morning… as long as you have thawed that frozen bird by now!! To add to the information, Safeway also provides videos on getting the bird from the freezer to the table for those that like to watch their cookbooks rather than read them.